Krishna is a Hindu deity, worshipped across many traditions of Hinduism in a variety of different perspectives. Krishna is recognized as the eighth avatar of the god Vishnu or as the Supreme God in other traditions. 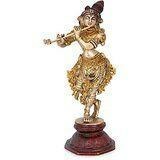 Krishna is one of the most widely revered and most popular of all Hindu deities. Krishna is often described and portrayed as an infant eating butter, a young boy playing a flute as in the Bhagavata Purana, a young man along with Radha or as an elder giving direction and guidance as in the Bhagavad Gita. Size : 9.5 Inches Height X 3.3 Inches wide X 3.3 Inches depth. Weight : 1.6 Kg Material : Brass.-------------- Pls beware from Copy product & ensure buying authentic product. This is exclusive inhouse design & product of Brand "Collectible India" and "covered by intellectual property rights laws". 'Collectible India' doesn t authorize any other Brand/Seller to sell it and we won't be responsible if any counterfeit or substandard product send by any other seller.